Tuesday night/Wednesday morning Alex woke up to eat around 12:30. As I was feeding him I heard the sump pump run 3 or 4 times. I thought this was really weird, since the only time the sump pump runs is when it rains or snow is melting. It was -6 degrees that night. As the baby was eating I grew more and more confused. Then, I thought I heard some water running. I laid down the baby and went out to investigate. The water sound was coming from the laundry room. I had started the washer right before I went to bed, over 2 hours earlier. It had been filling all that time and was overflowing. I spent the next hour cleaning up water (which thankfully had not gone outside of the laundry room, and instead had ran into the crawl space, thus the sump pump running). The repair man came and decided it could be fixed ... but he had to order parts. So, we are without a washer for a week. I had tons of wet towels from cleaning up the flooding ... and we do have 8 people living in our house, so I was off to the laundromat on Friday morning. Caleb went along to help me carry the wet laundry. 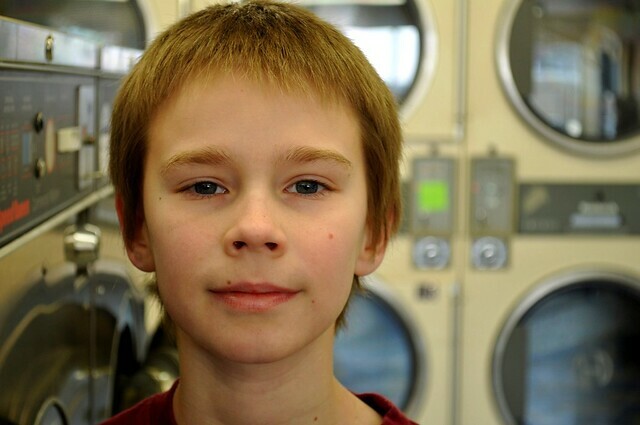 While we were waiting, I snapped a few pictures of him in the laundromat. Hopefully, I can make it until Wednesday, when the repairman returns to finish his repairs. The laundromat isn't my favorite place in the world, but going makes me thankful that I have a washer and do not have to make the trip there on a weekly basis!